We are seeing nymphs of toad bugs in cranberry beds. Growers need to be aware of this insect and treat if numbers reach high levels (there is no current threshold). We are currently conducting studies to estimate the density of toad bugs that can cause economic injury to cranberries. Life cycle. Toad bugs, Phylloscelis atra, feed only on cranberries. This insect has a single generation per year. It overwinters as eggs. 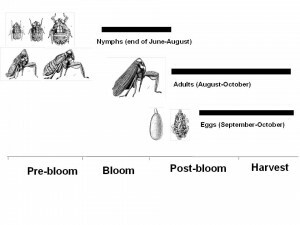 The nymphs appear by the end of June through August, and the adults from August through October. Eggs are laid from September through October. Damage. Feeding damage can be noticed in two stages. First stage feeding damage on vines causes closing in (towards the branch) of the leaves on the new growth. Second stage feeding causes changed in color (reddish to brown) of new growth. The damage can be seen from July until harvest. This damage will cause dying of the branch and the berries to shrivel up. Heavy infestation will result in dwarfed berries. Management. To determine infestation, lightly sweep problematic beds (bugs should be easy to catch in sweep nets as they are very active). Because this is a new pest there is no threshold established yet. Thus, insecticide applications should be based on the relative number of bugs per sweep compared with other sites and previous history of infestation. Currently, growers can use the following control options: Sevin 4F (broad-spectrum carbamate), Diazinon, Imidan 70W (broad-spectrum organophosphates), Actara or Assail 30SG (neonicotinoid insecticides, effective against piercing-sucking insects). If infestation is high, treatments should be applied at this time of the year. For more information, please see “The Cranberry Toad-Bug” by F.A. Sirrine and B.B. Fulton. 1914. New York Agricultural Experiment Station. Bulletin No. 377. Department of Agriculture, Geneva, NY.